Villa Cipresso is a XVIII century stone farmhouse that sits on a hilltop in the unspoiled countryside between Todi and Orvieto. It is part of the extensive Pianesante Estate. The house has been fully restored using old terra cotta pavements and beamed ceilings, all according to local tradition, retaining the original atmosphere of a traditional Umbrian rural house. All 4 bathrooms are spacious and comfortable. There is a well equipped kitchen and a large dining room. There are three double bedrooms, and a large sitting room with open fireplace. The house is situated at the end of a private road surrounded by natures and fenced-in, ensuring maximum privacy. In front of the house, facing the valley, there is a large patio with a dining table. Next to the pool a loggia with comfortable garden furniture and barbecue creates the perfect outdoor dining area, a very special feature is the original pizza wood oven. Views from the swimming pool are of the classic countryside, hillsides, forest and the ancient village of Collelungo, providing twinkling lights at night. More information is available on our website, please ask for link. Festival that take place during your stay. (near Perugia). This small town has a century long tradition in this art. In Todi, tennis, archery, horseback riding, golf. If you are looking for a villa that features 100% privacy, peace and tranquility, with a lot of open space, a beautiful pool, a lovely view and comfortable bedrooms this is the one! Cipresso is fully renovated, features a great outdoor dining area and a great lay-out for all the family traffic. Previous guest have all been greatly satisfied. The location makes this home the perfect retreat either after busy days exploring Umbria for those who like to relax away from the hustle and bustle of daily life. At the same time however charming villages are nearby as are interesting cities and all modern time conveniences. A stay at Cipresso offers you the best of everything. And maybe even more convincing, our rates are very reasonable! toilet, shower, bidet, Ground floor bathroom just off the living room with window. toilet, combination tub/shower, bidet, Spacious en-suite bathroom with window. toilet, shower, bidet, En-suite bathroom for up-stairs bedroom, with window. toilet, combination tub/shower, bidet, En-suite bathroom for bedroom upstairs, with window. All full bathrooms, 3 with shower, 2 with a bathtub, all nice and spacious. Hairdryers are supplied. In the living, fire wood at additional costs. Space for many more than just one vehicle. The kitchen features an electrical oven however outside there is an original wood oven, perfect for pizza's. The fireplace can be used for roasts. Both inside and out two large tables make the perfect setting for either and indoor meal or good Italian dining 'al fresco'. The porch next to the pool is another perfect location for any meal. Lawn with flower sand mature trees on the side against a backdrop or woodlands and olive groves. Large porch with dining table and plenty of space for relaxing in the shade. Near Perugia the Robert Trent Jones Golf Course, The Perugia golf club and near Panicale the Lamborghini Golf Club. Rome offers plenty of opportunities as well. This villa's groundfloor is perfectly accessible for wheelchairs, and licensed according to Italian laws. Please inquire for further details. A huge one with a great view!!! Depth 140 cm, exit by ladder. The area of Todi is famous for its natural beauty. The landscape is beautiful with many routes and destinations reachable by foot or bike. There are three mountain bikes available for the guests. There is a marked route through the nearby woods. Umbria is famous for its excellent produce and there are excellent gourmet restaurants in the area. We will be happy to describe and recommend the best ones. We have an outstanding cook at Villa Cipresso. Under request, he prepares excellent lunches or dinners for the guests. He also makes cooking demonstrations, wine tasting sessions, and cooking classes. The cook will personally discuss the menu with guests. Most of the ingredients used come from farms in the area (oil, eggs, vegetables, fruit, and wine). All ingredients are 'organic'. Available: massage, baby sitting, guided tours, wine tastings, and car with driver, etc. 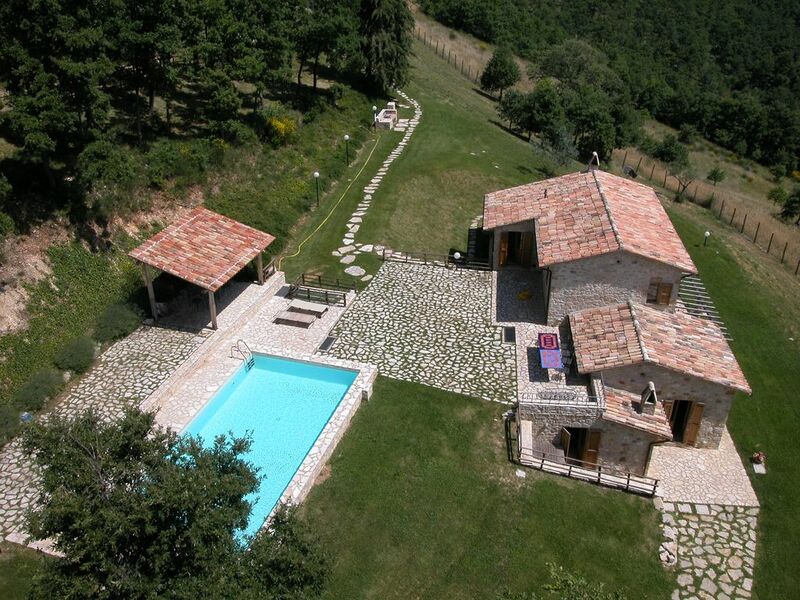 Villa Cipresso is conveniently located near Todi, Orvieto, Spoleto, Assisi, Gubbio, Siena, and Perugia. Easy day trips can be arranged also to Rome, Siena and Florence. There are a number of incredible medieval churches, Roman towers, and fantastic Renaissance Piazzas (squares) to be seen and discovered. Year round, many festivals take place. Ballet, Music, theater and visual art exhibitions. The most famous ones are the Todi festival, the Umbria Jazz festival and the Spoleto festival. The owner of Villa Cipresso will be happy to inform you about all the Art Festival that take place during your stay. Local craft is very interesting, in particular the ceramics in Deruta (near Perugia). This small town has a century long tradition in this art. In Todi there is tennis, archery, horseback riding. Norcia is well known for its truffles and salami, as Perugia is known for its Perugina chocolate, tours of the factory are avaiable. Other Activities: massage, guided tours, chef available, truffle hunt, wine tastings, orvieto underground, waterfalls and rafting in terni.